I wanted to try something photorealistic tonight. Since it’s fall, I figured I’d try a leaf. I grabbed this one from the driveway because it was the first whole leaf I saw. I started by painting the shadow in moonglow. Then I painted the stem since it was darkest I figured I could mess with color until I got it right on the stem. It turned out to be pretty easy to get the base coloring right with just burnt Sienna and Phthalo blue. At first I mixed the two into a very neutral grey to get the base wash down. I added more pigment to darken areas where the leaf was curled. Once I finished that, I had a general map of the high points and low points to guide me. This turned out to be a very good thing because as I painted the actual leaf I was trying to paint curled up more as it dried. I added more burnt Sienna to the grey and layered that down, and as it dried the blue started to appear from under the grey which gave me some really beautiful color gradations that I tried to play on as I went. After the brown layer was down, I added some Bloodstone to the edges to start defining the boundaries, and dabbed some spots in here and there. I was trying to figure out how to mask off the white paper so I could just splatter, but decided to just be more meticulous, and dot the spots in one at a time. I’m certain this was a good choice. After that, I sprinkled some salt down to see if I could get it to give me some texture, and I like the effect that produced, though I’m not sure if the salt impacts the pH of the painting-maybe that’s not a good archival technique. I googled a bit, but couldn’t find anything definitive one way or the other. After that, I put some clean water down, and dropped color in to add interest, some more orange/brown where the leaf was curling at the edges, and green toward the center, where maybe there was still some chlorophyll left. After that, I added some more Bloodstone to the edges, and tried to outline the holes to make them stand out more. 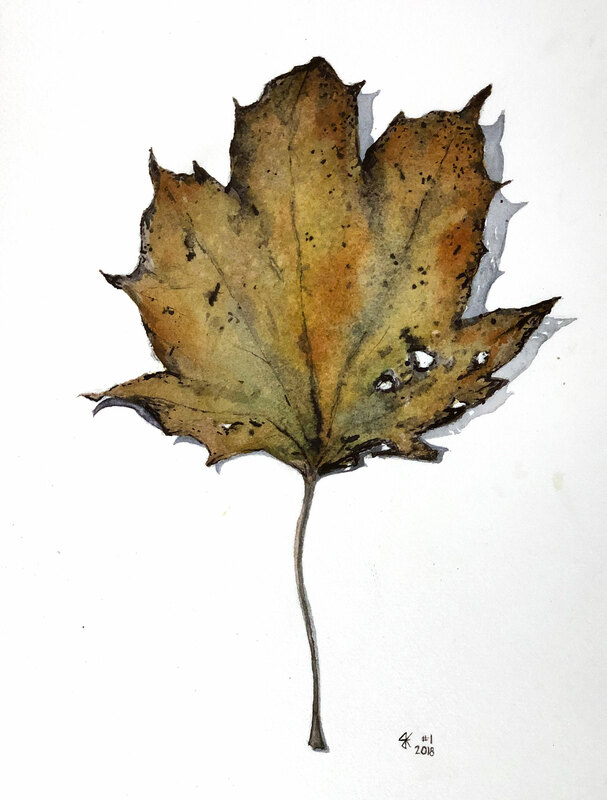 Once that dried, I glazed a very watery moonglow to add more shadows to the interior of the leaf, then finished with suggestions of the veins. When I was done, I felt that the shadow was too grey, so I started to darken it. This caused the shadow to blend in with the edges of the leaf and threatened the strong edges I had worked so hard to establish, so I stopped. I tried to lift out what shadows I had darkened, but you can still see where I made that mistake in the shadow on the lower left. Other than that, I am really proud of this one. I wanted to paint a photorealistic leaf, and I think I did. I’m pleased.